Recently, laziness has been causing the disappearance of bento from my life. Even more laziness has led me and my colleagues to go for fastfood deliveries, rather than going out to buy lunches. Still, this bleak scenario did lead to the discovery of something interesting. It led us to delivery.ph! 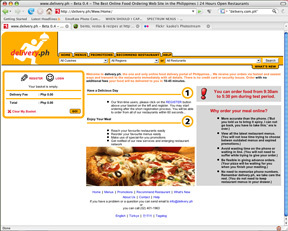 A 3-month old Manila-centric food portal, delivery.ph gathers various fastfood outlets and restaurants that offer delivery services and centralizes the whole system through a website. You sign up, choose a restaurant, then make your order. Imagine, you don’t have to dig up those delivery flyers (we keep an envelope of them in the office) to get food. Everything, the menu and prices are all there. You can even see your total balance before you check out. Plus, after your initial registration, they’ll keep your address on file so you donâ€™t have to repeat your address each time. Excited to try it out, I registered, chose Yoshinoya as our restaurant, stuffed food in the cart, then checked out. Minutes later, someone called us up to confirm our order and address. Another few minutes later, someone called us up again to give us an update and tell us that our food was on the way. In a little over 40 minutes (the site claims 10-45 minutes for deliveries) from placing the order online, we received our food! And you can even schedule your deliveries for a later time. How cool is that? In addition, they claim that they don’t have additional charges and while there was a delivery charge on our receipt, I think it’s a standard fee with Yoshinoya and not the website, because Yoshinoya’s store flyers also list that same delivery charge for phoned in orders. Right now, they’re on Beta testing mode and operate only from 8:30 am to 5:00 pm and service just a handful of restaurants. They also service a limited area (Metro Manila) but who knows what the future will bring? I’m crossing my fingers that their service will take off and take on more clients. Imagine if they do! 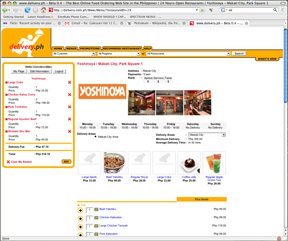 A gajillion restaurants through one website portal. A lazy, netbound kaoko’s dream, for sure! This entry was posted in link love, restos & eateries. Bookmark the permalink. i hope by the time na umuwi na kami, this is in full effect. although we are staying at makati and so near to restaurants, it is very convenient to order in when you don’t feel like going out. That sounds so awesome. 😀 I wish they had something like this in the US. Or wait… do they? To the search engines! Ah, how I envy you. 😀 I know, I know, we can always call for delivery but it’s nice to have it all centralized. It is, isn’t it? I wish they’re able to make it work. I think its success will depend on the restaurants they get. hey this is nice! consider this bookmarked! Definitely! I do hope they manage to beef up their list of clients though. A wider selection will surely yield more users.